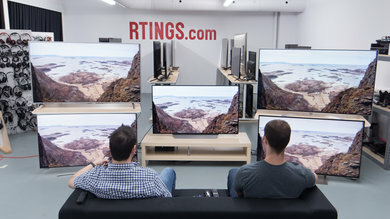 43" 50" 55" - 58" 65" 75"
The Samsung RU7100 is a good 4k LED TV that has decent overall picture quality. It can deliver deep blacks, thanks to the high native contrast ratio, and it is good for a dim room. 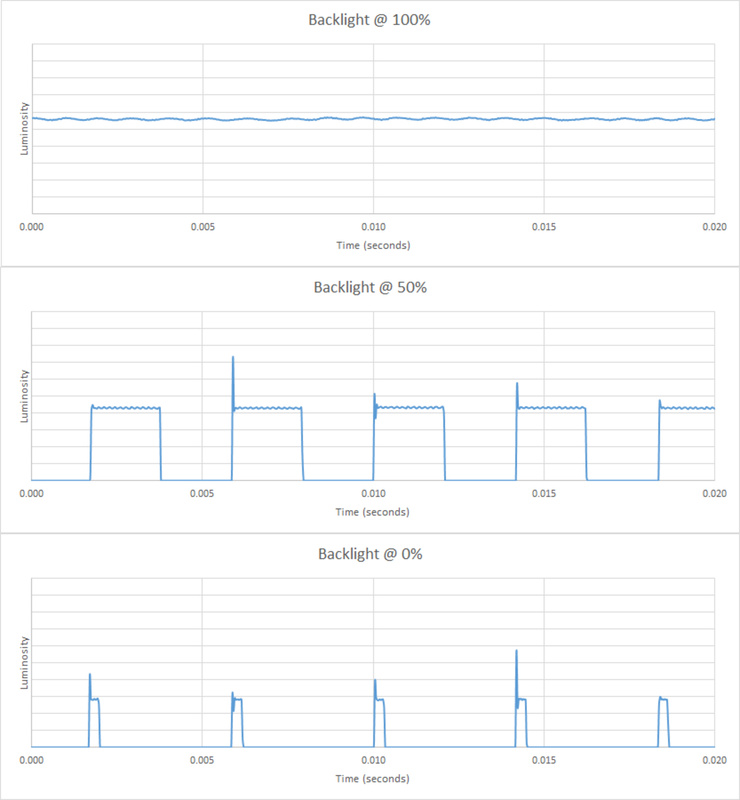 However, it lacks a local dimming feature to further improve dark room performance. It has good gray uniformity and great color accuracy out of the box. 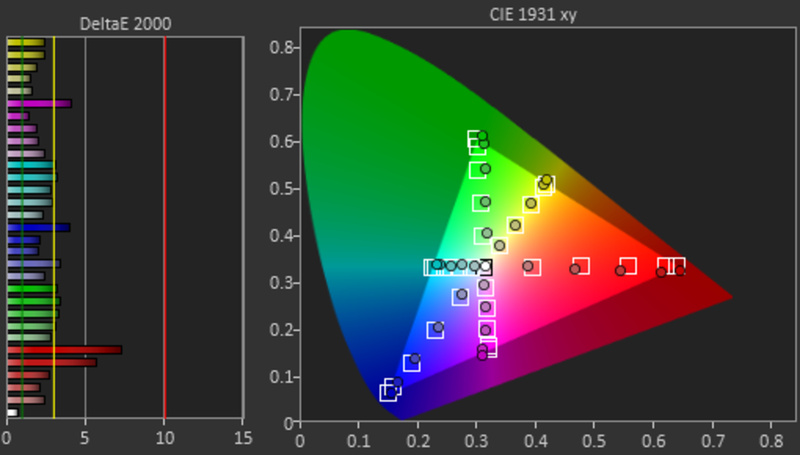 It doesn't have a wide color gamut and can't get very bright, especially in HDR. Motion handling is mediocre, but the input lag is remarkably low, which makes the TV very responsive; something that will please gamers. 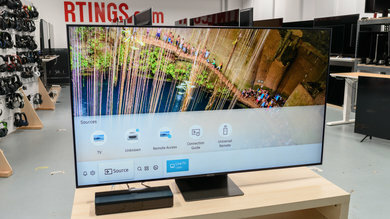 Unfortunately, it does not support any of the advanced gaming features found on higher-end Samsung models, and the image loses accuracy when viewed from the side. 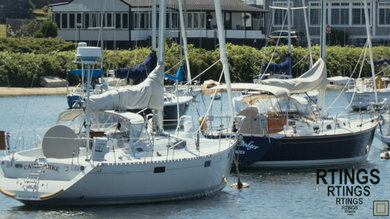 Image degrades when viewed at an angle. 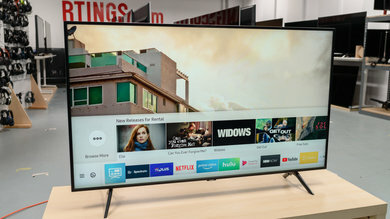 The Samsung RU7100 is a 2019 entry-level UHD TV. It is the replacement of the NU7100 in Samsung's lineup, and it is meant as a more budget model that lacks some of the more advanced features found on the higher-end UHDs like the Samsung RU8000. 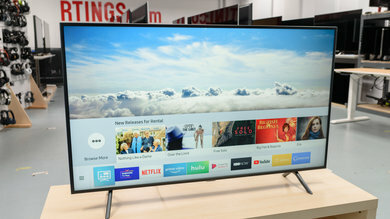 It is comparable to most other budget LED TVs, like the LG UK7700 or the Vizio E Series 2018. The design of the Samsung RU7100 is excellent, similar to last year's Samsung NU7100. 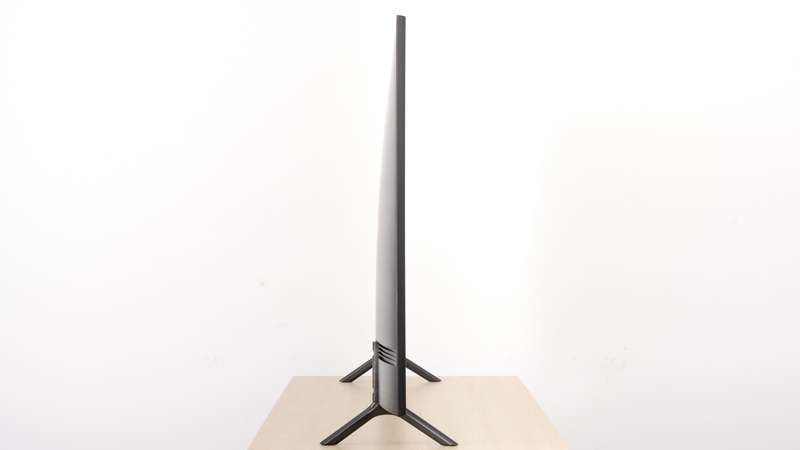 The stand supports the TV well and allows only minimal wobble. 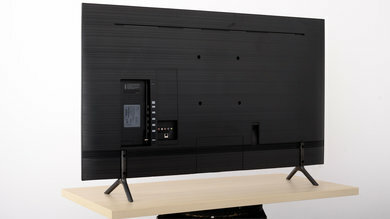 It is, however, nearly as wide as the TV, so you need a large table to place it on. 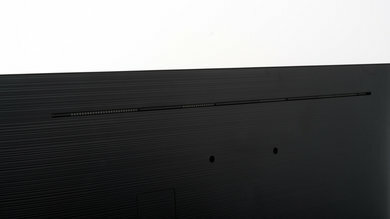 The back of the TV is made of plastic with the same textured finish found on last year's Samsung TVs. Cable management is serviced through guide tracks on the back of the TV and with the help of a couple of clips that attach to the legs. The build quality is decent, and you should have no issues with it. The stand is plastic but supports the TV well. 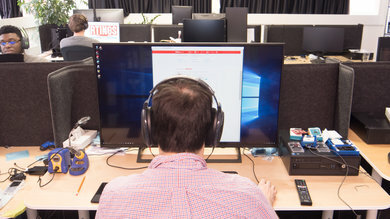 It is almost as wide as the TV, and the legs cannot be reversed. There is some wobble, but not too much. Footprint of the 55" TV stand: 38.3" x 10.4"
The back of the TV is plain. It is made of good quality plastic and the texture is matte with a lot of fine horizontal ridges, just like last year's NU7100. Cable management is serviced through tracks found near the bottom of the back and the special clips that attach to the legs, as shown here. 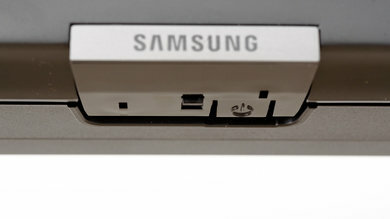 The borders of the Samsung UN55RU7100 are plain and have an average thickness. The RU7100 has almost the same thickness as last year's NU7100. 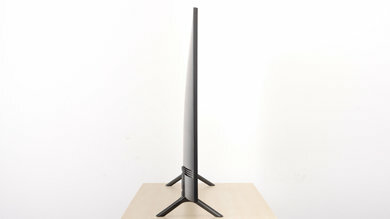 The thickness is roughly uniform, which looks good if you VESA mount it. The bottom edge of the Samsung RU7100 gets quite warm. This is likely due to the edge LEDs, but shouldn't cause any issues. The RU7100 has decent overall build quality. The external casing is almost entirely made of plastic. There are no gaps or loose ends other than some flex in the seam where the back joins the borders; this should not be an issue. The picture quality of the RU7100 is decent. It has a high native contrast ratio and can deliver deep uniform blacks, but it lacks a local dimming feature to further improve dark room performance. It can get decently bright, and it is more suitable for an average-lit or dim room. It does not have a wide color gamut and cannot get bright enough to deliver a good HDR performance. 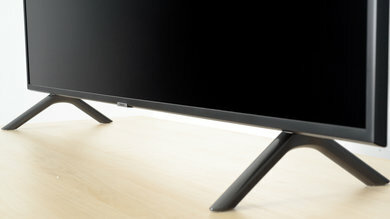 The Samsung UN55RU7100 has decent reflection handling and good gray uniformity that will please most sports fans. Unfortunately, it has narrow viewing angles, just like most VA panel TVs, and the image quickly loses accuracy when viewed from the side. The native contrast ratio of the RU7100 is excellent. This is great for watching movies in a completely dark room. Unfortunately, the TV does not have a local dimming feature to further improve the contrast ratio. 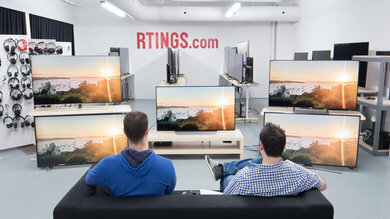 The Samsung RU7100 does not have a local dimming feature. The above video is provided for reference only. 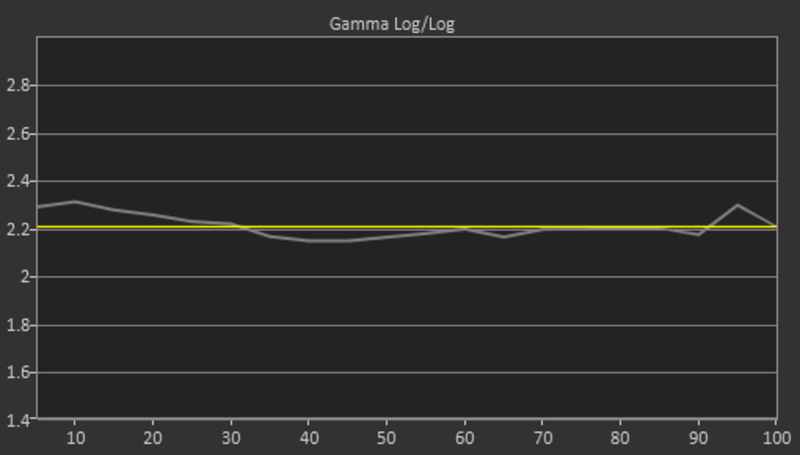 The SDR peak brightness of the RU7100 is decent, just slightly better than last year's NU7100. 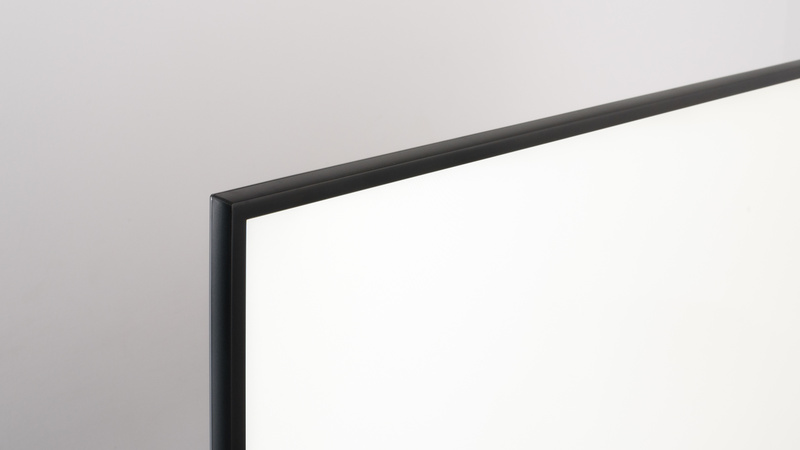 The UN55RU7100 is more suitable for average-lit or dim rooms, as it cannot get bright enough to overcome glare. We measured the peak brightness after calibration, using the 'Movie' picture mode, 'Warm 2' color temperature, '2,2' gamma, and we set Auto Motion Plus Settings to 'Off.' 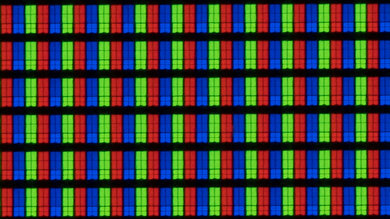 Different picture modes and color temperatures may be brighter. 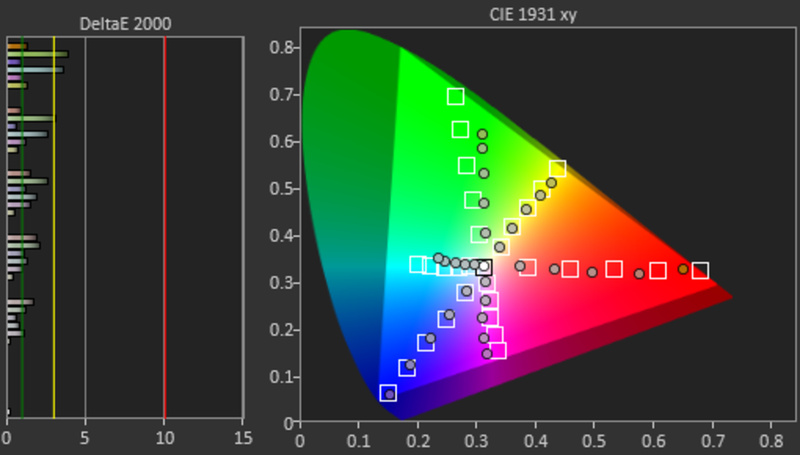 The HDR peak brightness is disappointing. The RU7100 can't get bright enough to deliver a vivid HDR image. 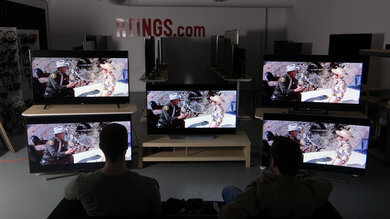 Small highlights in dark scenes are dimmed by the TV's algorithms, as shown by our 2% window test. This is known as CE dimming. Our measurements were taken in the 'Movie' picture mode, with no calibration settings and Auto Motion Plus settings set to 'Off.' Some settings may produce a brighter image. The RU7100 has good gray uniformity. 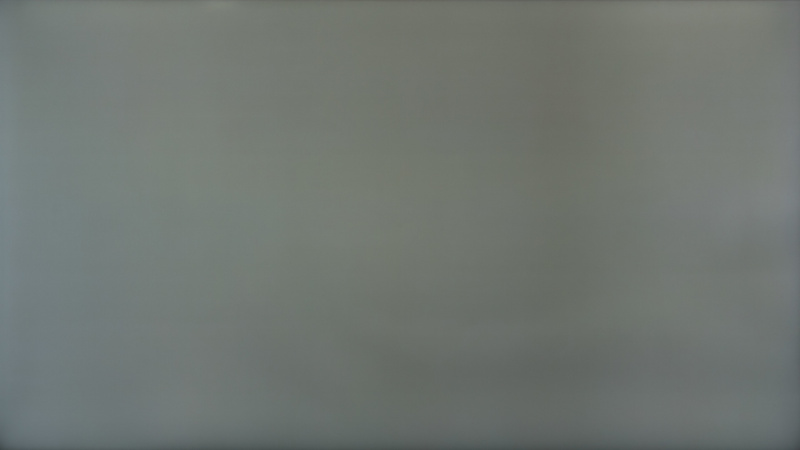 The 50% gray image is a little darker at the sides and especially at the corners. 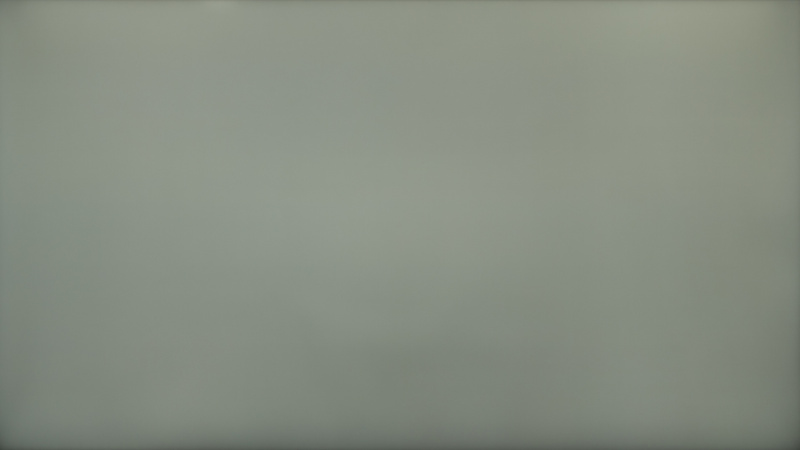 However, the center of the screen is more uniform, so the minor dirty screen effect isn't very noticeable. This is great news if you enjoy watching sports. 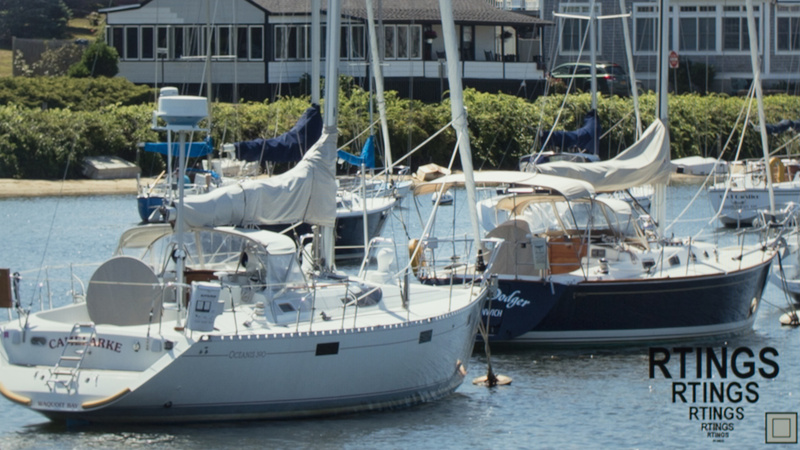 In the 5% gray image, the uniformity is good and you can't easily spot any uniformity issues. The viewing angle is disappointing, just like with most VA panel TVs. The image loses accuracy at fairly small angles off-center. 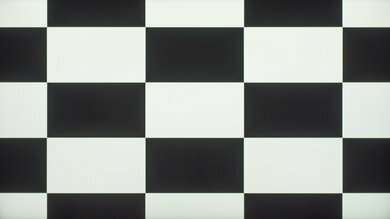 As you increase your viewing angle, you will first notice the blacks intensifying, then a shift in grayscale shades followed by a shift in the colors, and finally, the brightness will begin to fade. 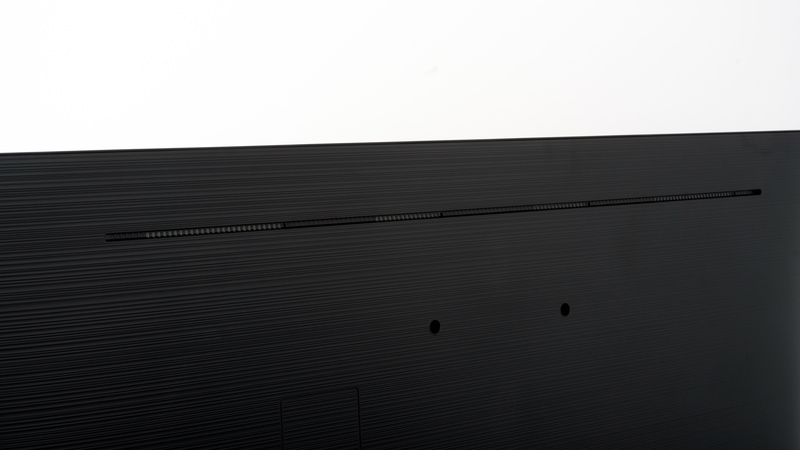 The RU7100 has very good black uniformity. 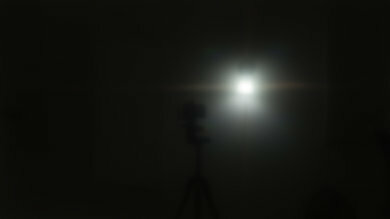 Although you can see some flashlighting, it is not very visible under normal viewing conditions. It becomes more noticeable if you watch a very dark scene in a dark room. Unfortunately, there is no local dimming feature to improve black uniformity. The UN55RU7100 has decent reflection handling. The semi-gloss screen handles reflections very similarly to the NU7100. In most rooms, there shouldn't be any issues, but in a bright room with many windows, reflections might become distracting. 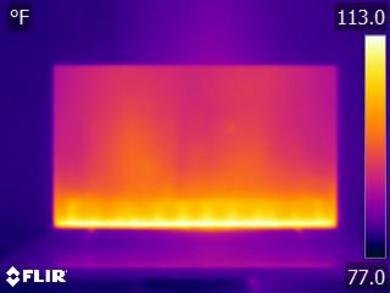 The out of the box color accuracy of the RU7100 is great. The Picture Mode that gave us the best results is the 'Movie' picture mode. The minor color inaccuracies are hard to spot unless you are an enthusiast. With Color tone set to 'Warm 2,' the color temperature is slightly colder than the 6500K target. 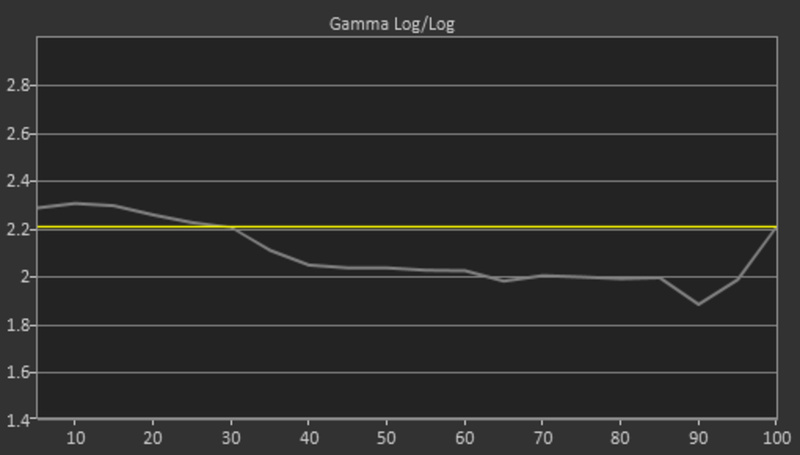 The gamma does not follow our target and some scenes are brighter than others. 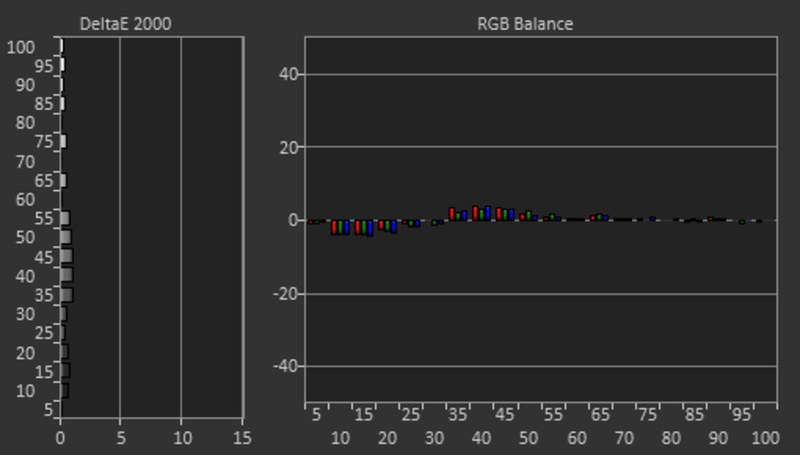 The RU7100 has excellent color accuracy after calibration. Any remaining inaccuracies are almost impossible to spot without the aid of a colorimeter. The color temperature is almost spot on the 6500K target, and the gamma follows the target curve more closely, but not perfectly. 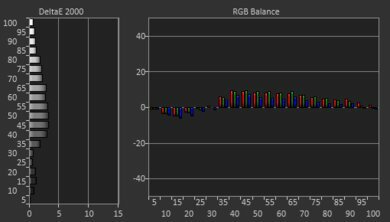 Changing Color Space settings from 'Auto' to 'Custom' reduced the color gamut drastically, so we had to make big changes in the color calibration. We recommend that users leave it at 'Auto' to avoid this. 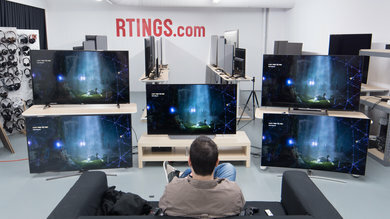 Blu-rays and other 1080p content, including non-4k console games, are displayed well. 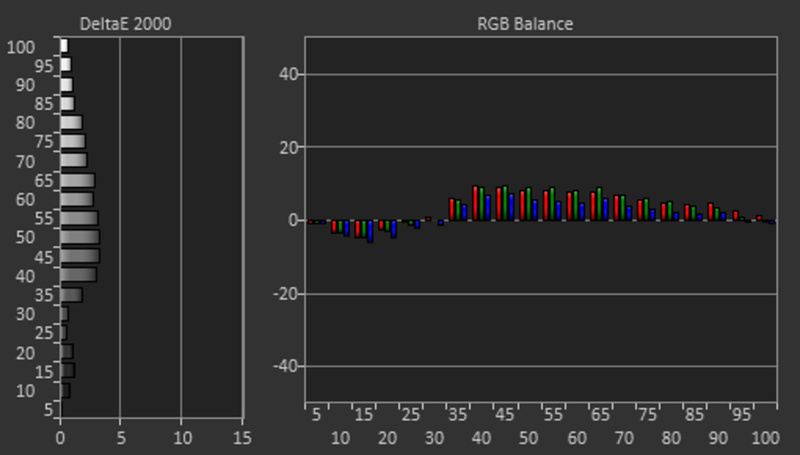 The RU7100 has a decent color gamut. It is not wide enough for great HDR performance, but it is still wider than most SDR TVs, and an improvement over last year's NU7100. 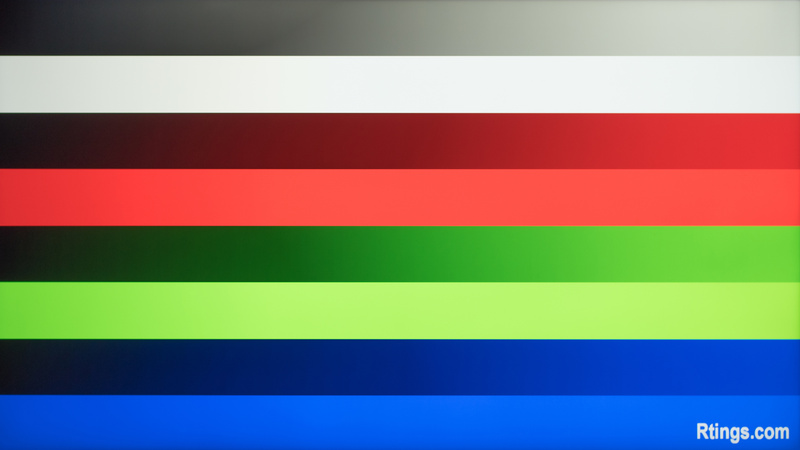 The 'Movie' EOTF cannot follow the input stimulus closely and produces less bright images.If you find HDR content too dark, you can try setting Contrast Enhancer to 'High' and Brightness to '5.' With all of these enabled, the image gets brighter, as shown here. 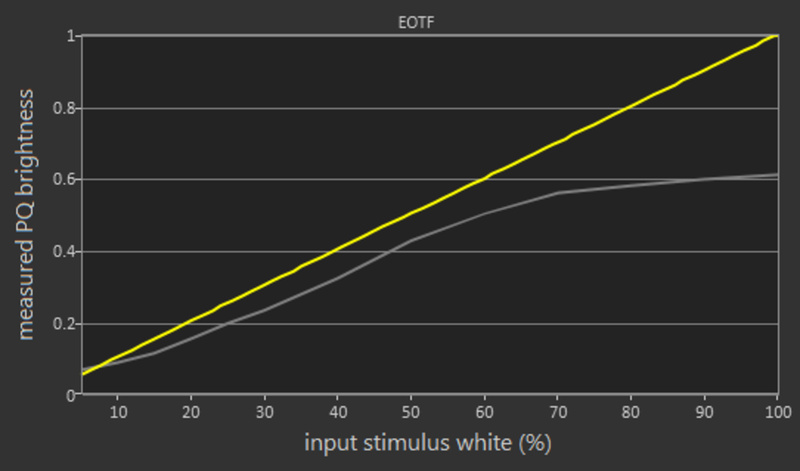 In 'Game' mode, the EOTF cannot follow the target curve closely and starts to roll-off relatively early, very similar to the 'Movie' mode EOTF. 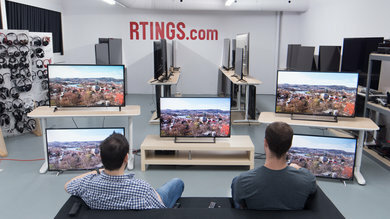 The RU7100 has disappointing color volume, which is expected for a TV without a wide color gamut. 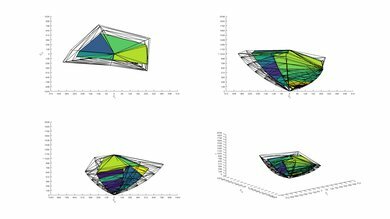 It is not a significant improvement over the NU7100 as it cannot produce bright saturated colors like those in a bright outdoor scene. The RU7100 has good gradient handling.  Some moderate banding is noticeable in dark gray, green, and blue. This is hardly noticeable in person. Unlike higher-end Samsung models, setting Digital Clean View to 'Auto' didn't remove banding in our test image. The motion handling of the Samsung RU7100 is mediocre. It has a fast response time, so there is only a very short blur trail behind fast-moving objects. The backlight uses PWM to dim and the flicker frequency is 240Hz but it drops to 120Hz in some modes, and this might bother some people. This TV has very little stutter, and motion appears fluid in lower frame rate content like movies. It supports motion interpolation up to 60Hz and has a Black Frame Insertion feature to make the image crisper, but it does not work very well. Very good response time for the RU7100. 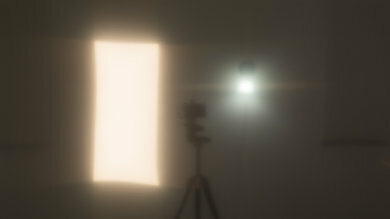 Most transitions are fast, so there is only a very short blur trail behind fast-moving objects.  In dark scenes, however, some smearing may be present due to the longer transition between darker shades, such as from 0% to 20%. The RU7100 uses PWM to dim the backlight. Only when the backlight is set at max is there no flicker. 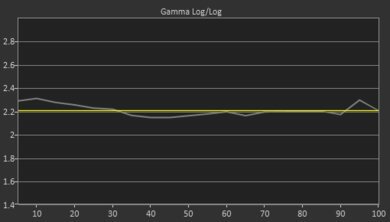 The flicker frequency is 240Hz and was measured in 'Movie' mode with Auto Motion Plus disabled. 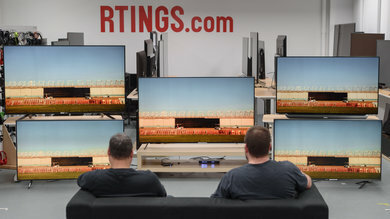 Unfortunately, some TV settings have 120Hz flicker. 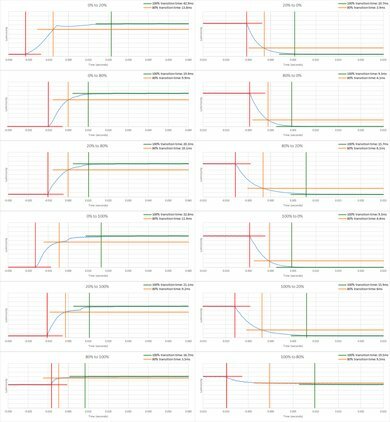 Simply setting Auto Motion Plus to 'Custom' changes the flicker to 120Hz. 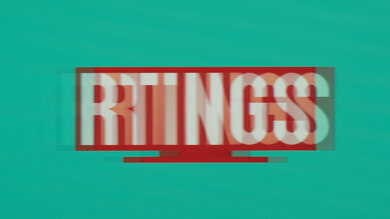 The 'Game' and 'Standard' picture modes have 120Hz flicker all the time, as shown here. 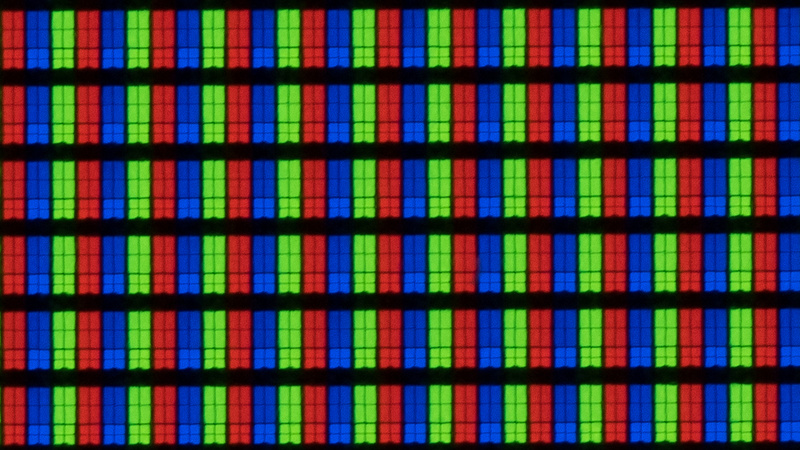 This changing flicker frequency has also been observed in other Samsung TVs like the Q60R. Activating LED Clear Motion changes the flicker to 60Hz. 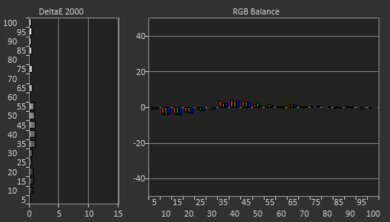 Unfortunately, motion with 60Hz BFI doesn't look good, as you can see in the photo above. This happens because the pulse timing isn't very good. The backlight pulse catches the TV in mid-transition, resulting in the double-image seen in the photo. In 'Game' mode, the backlight always flickers at 120Hz, and unfortunately can't be made to flicker at 60Hz. The Samsung RU7100 can interpolate lower frame rate content up to 60Hz. To enable motion interpolation, set Auto Motion Plus to 'Custom' and adjust the Judder Reduction slider. Leave LED Clear Motion to off unless you want Black Frame Insertion. 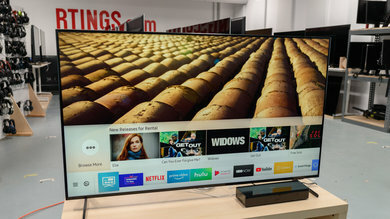 Note that, like many Samsung TVs, simply setting Auto Motion Plus to 'Custom' changes the backlight flicker from 240Hz to 120Hz, as explained in the Flicker-Free box. 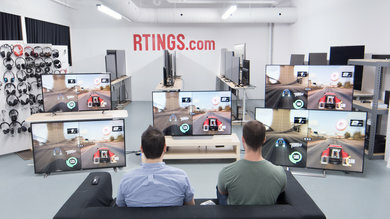 Low-end Samsung TVs like the RU7100 do not have a Game Motion Plus option to add motion interpolation in 'Game' mode. 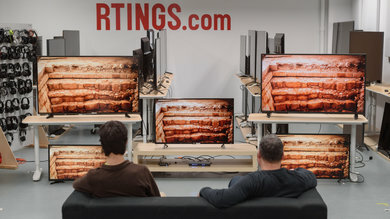 The RU7100 is great at displaying content without stutter, even on low frame rate movies. The transition between frames appears smoother thanks to the slower response time. 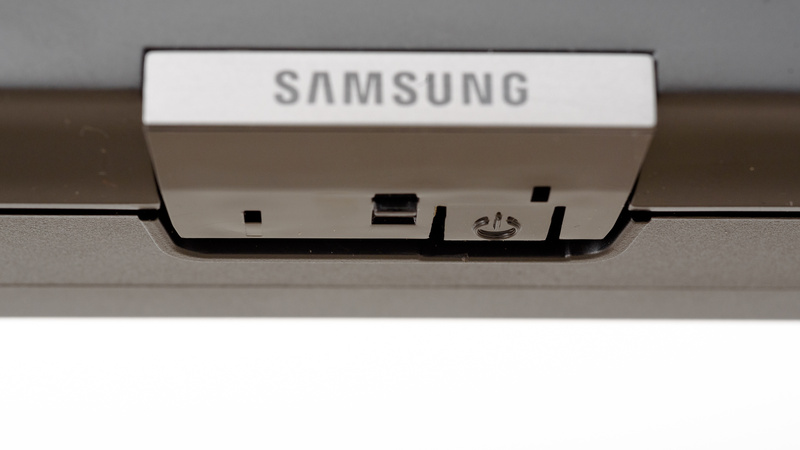 Unfortunately, the Samsung UN55RU7100 cannot remove 24p judder from any source. 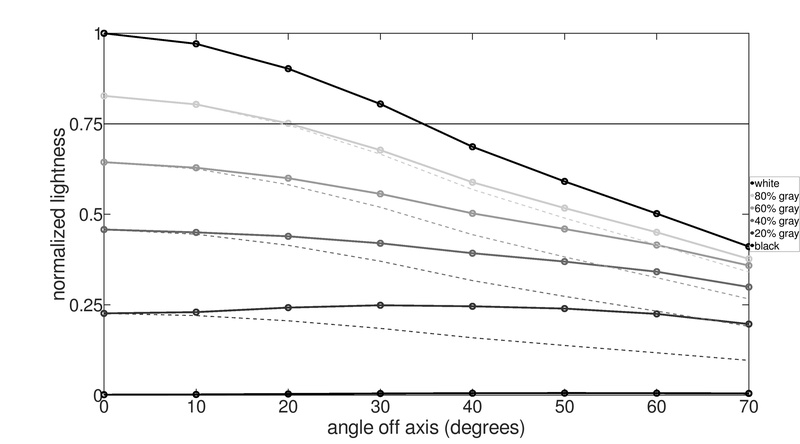 We tried setting Auto Motion Plus to 'Custom' and Judder Reduction to '0' but it didn't work. 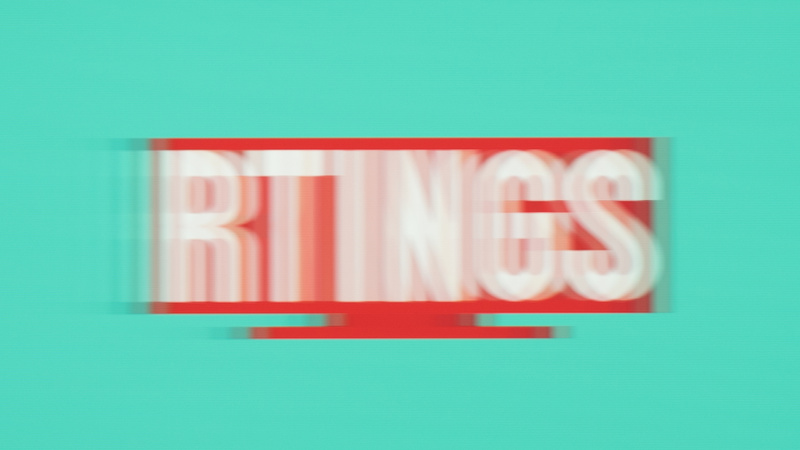 We also tried enabling Film Mode, but it didn't work either. 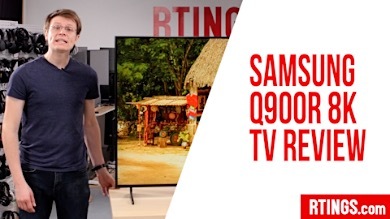 The Samsung RU7100 does not support AMD's FreeSync variable refresh rate as the higher-end Q60R model does. 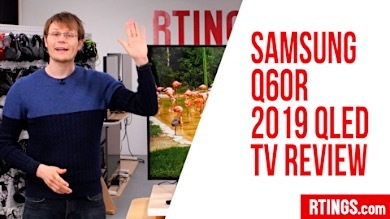 The Samsung RU7100 has excellent low input lag and supports most common resolutions, including 1440p @ 60Hz which has become popular among gamers. It displays proper chroma 4:4:4 in all supported resolutions as long as it is in 'PC' mode. Unfortunately, there is no support for DTS or eARC. 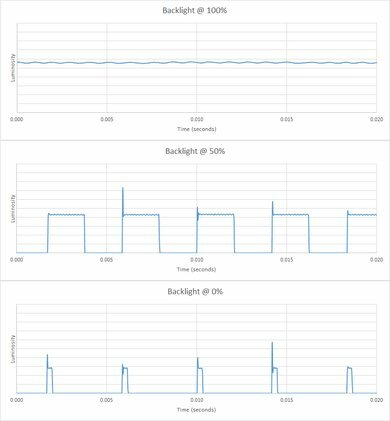 Excellent low input lag on the RU7100. Both 'Game' mode and 'PC' mode have low input lag. A welcoming change is that when in 'PC' mode, you do not have to enable 'Game' mode for low input lag, unlike on higher-end Samsung TVs like the Q900R. 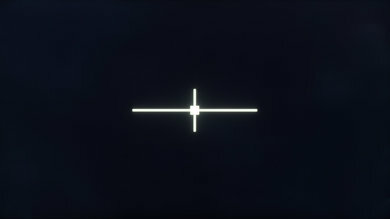 Chroma 4:4:4 is only properly shown when the input icon is set to 'PC,' denoting that the TV is in 'PC' mode. The RU7100 supports most common resolutions and refresh rates, including 1440p @ 60Hz, just like the Q60R. 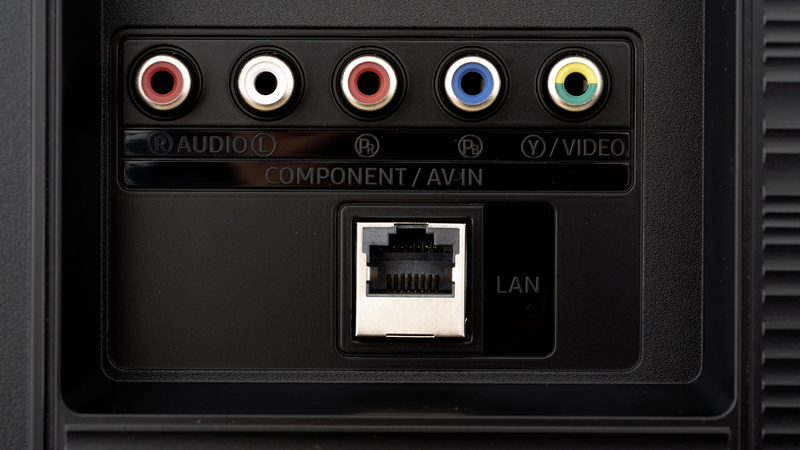 Full bandwidth signals, such as 4k @ 60Hz @ 4:4:4, require Input Signal Plus to be enabled for the input in use. 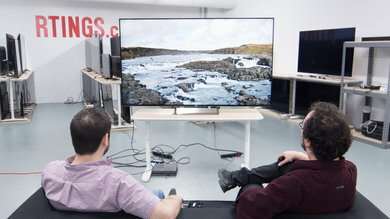 Input Signal Plus is the new name for what was previously known as HDMI UHD Color. Chroma 4:4:4 is properly shown in all resolutions provided the TV is in 'PC' mode. 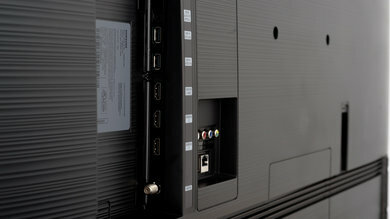 Unlike last year's NU7100 where all inputs were facing sideways, some of the inputs on the RU7100 are facing outwards. 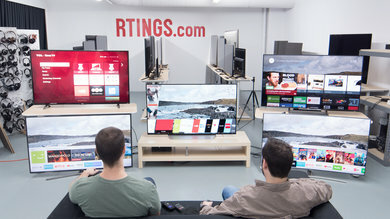 Like the Q60R and 2018 Samsung TVs, the RU7100 does not support DTS, nor does it support eARC. Like the Q60R, there is a Dolby Atmos Input setting, so it likely does support lossy Atmos passthrough via Dolby Digital Plus sources, such as the native Netflix app. The sound on the Samsung RU7100 is decent, almost identical to NU7100. It can get decently loud but may not be loud enough for large or noisy environments. It doesn't have deep bass and won't produce any thump or rumble, but it will deliver clear and intelligible dialog. For a better sound, dedicated speakers or soundbars are recommended. The frequency response is mediocre. 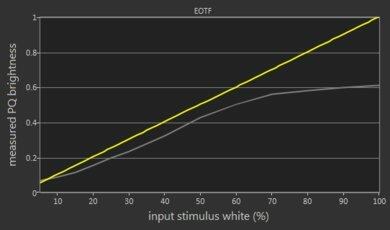 LFE (low-frequency extension) is at 80Hz, which is decent. This means the RU7100 has a decent amount of punch to its bass but can't produce any thump or rumble. The response above the LFE is relatively flat and well-balanced, and this results in clear and intelligible dialogs. 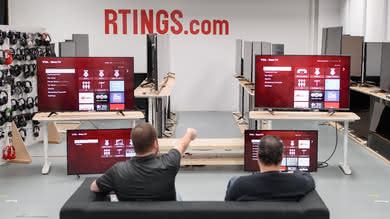 The RU7100 doesn't have a room correction system, and we weren't able to remove the modes of our test room around 200Hz. The RU7100 can get reasonably loud, but not loud enough for large and noisy environments. 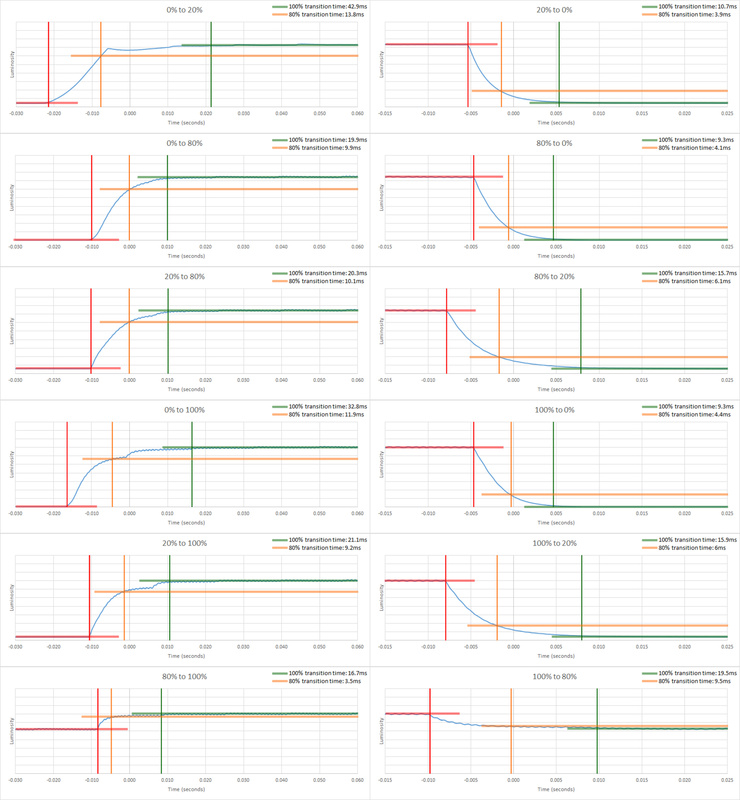 The distortion performance of the RU7100 is decent. 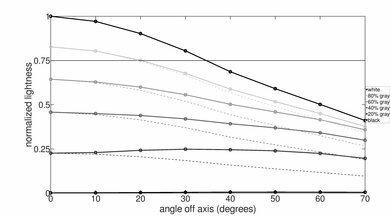 The overall amount of harmonic distortion produced is within decent limits, and we did not observe a big jump in THD under heavier loads either. The Smart features of the RU7100 are decent. 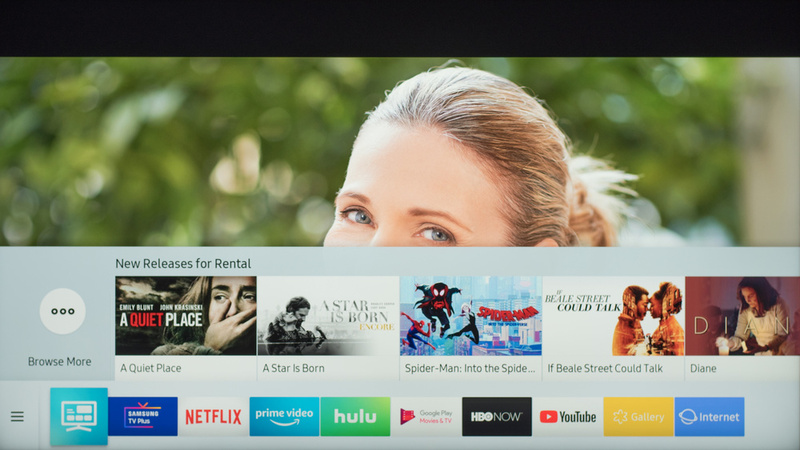 It runs the latest version of Samsung's Tizen OS, but some features are not available to budget TV models, such voice control. The OS gives you access to a wide selection of apps to choose from and is very easy to navigate. The remote is very similar to last year's NU7100, with the addition of three quick access buttons for Hulu, Netflix, and Prime Video. The interface of the RU7100 is easy to use and runs relatively smoothly. 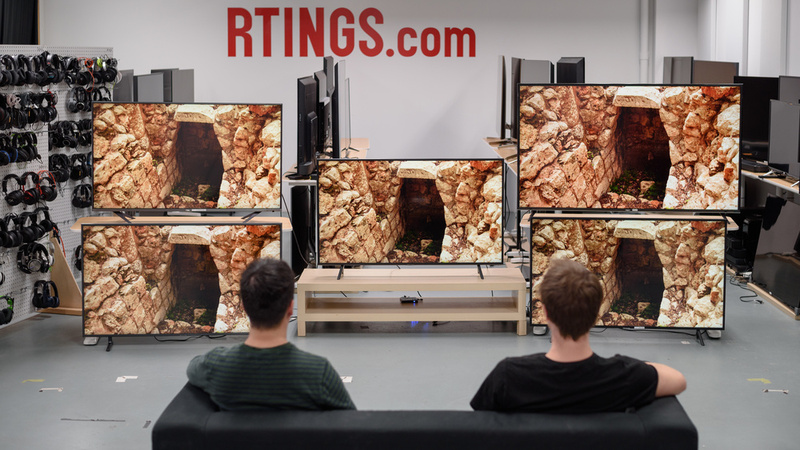 We did not find any serious issues during our testing, except that sometimes when you change the input from 'PC' to something else the edges of the screen are cut off due to overscan. Just navigating into the Picture Size setting fixes the issue, even if you don't change anything. Unfortunately, the RU7100 comes with ads and suggested content, and does not offer the option to opt out. 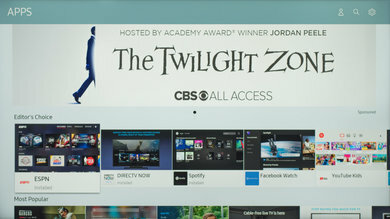 There is a small ad on the home bar and a large one in the app store (see the picture on the Apps and Features box). Samsung's app store has an abundance of apps to chose from. The apps run relatively smoothly and navigating through them is easy. The Samsung 55RU7100's remote control is very basic. There are no smart features like voice control and most of the buttons only serve basic functions. There are also three buttons for quick launching Netflix, Hulu, or Amazon Prime Video. 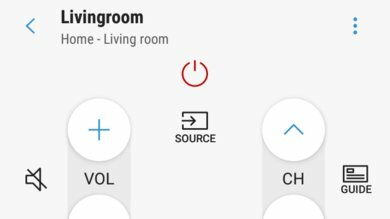 You can have basic control of the TV using Samsung's SmartThings app. 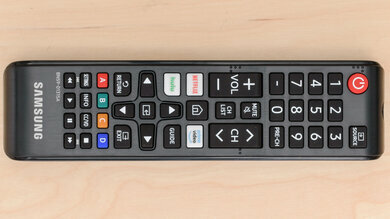 It can be used as a replacement remote but with limited capabilities. 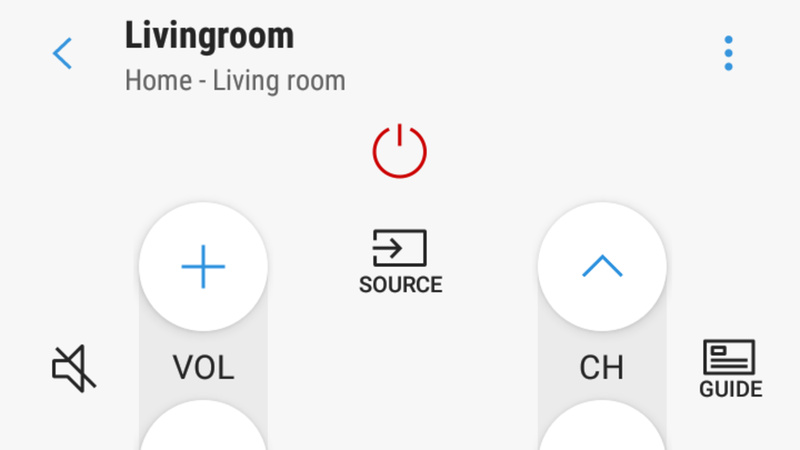 You can't directly launch apps or change inputs, and you can't use it to input text directly in the TV apps. 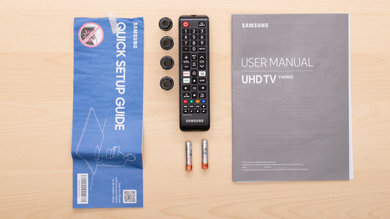 The controls are in the center of the TV underneath the Samsung logo. 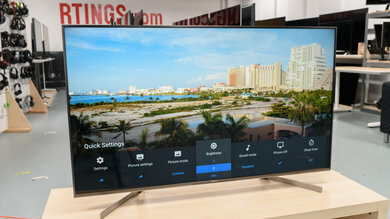 They are similar to the Q60R, with a single button that brings up a menu allowing you to turn the TV off, adjust the volume, or change channels/inputs. 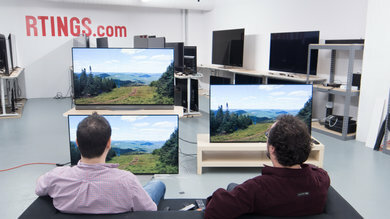 We tested the 55" (UN55RU7100) version FA01. For the most part, we expect our review to be valid for the other sizes of this model. 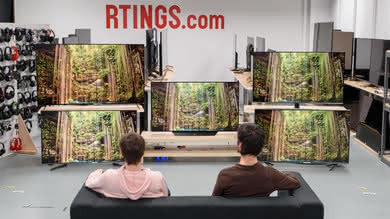 If someone comes across a different type of panel or if their Samsung RU7100 doesn't correspond to our review, let us know and we will update the review. 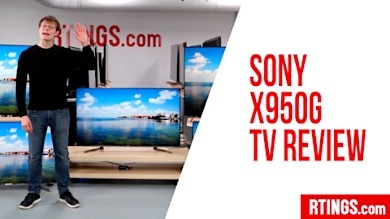 The UN55RU7100 we reviewed was manufactured in February 2019. 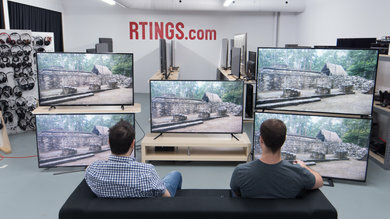 Top left: TCL R617 (55R617). 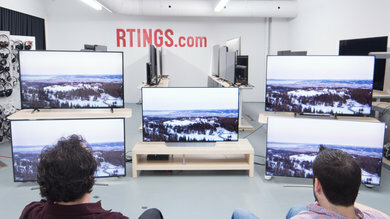 Bottom left: Samsung RU8000 (UN55RU8000). 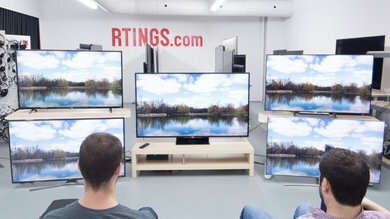 Middle: Samsung RU7100 (UN55RU7100). Top right: Vizio E Series 2018 (E65-F1). Bottom right: Samsung NU7100(UN55NU7100). Unlike our other photographs, this picture wasn't taken under a controlled environment, so do not draw conclusions from it. 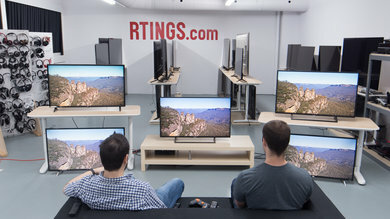 The RU7100 is a good entry-level UHD TV, but there are better TVs for the same price. 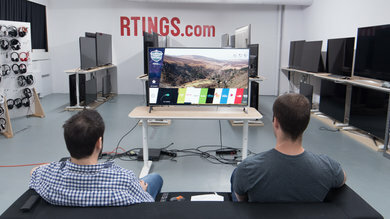 The Samsung NU7100 and the Samsung RU7100 both have very similar performance. The RU7100 has a slightly faster response time which is great if you watch sports, and a much lower input lag which is great for those who play video games. 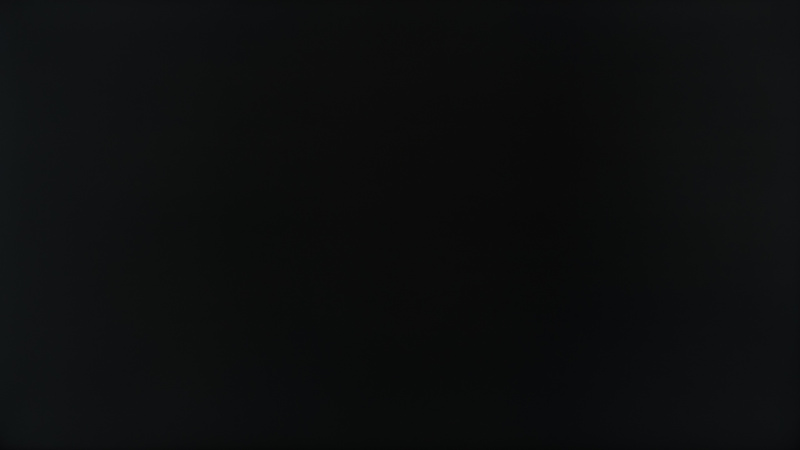 The NU7100, on the other hand, can deliver more uniform blacks. 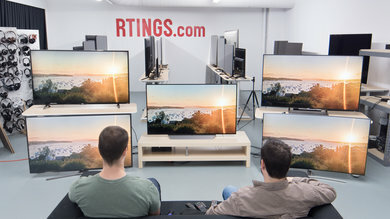 The LG UK7700 and the Samsung RU7100 are different types of TVs, so if you have a dark room and you sit straight in front of the TV, the RU7100 is a better choice as it has deeper and more uniform blacks. If you have a room with a wide seating arrangement and many lights, then the LG UK7700 is a better choice as the image remains accurate when viewed from the side and the TV has better reflection handling. 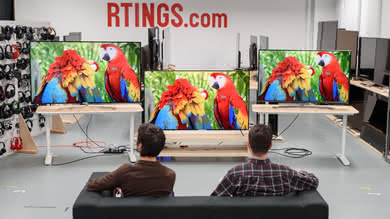 This is a good TV for mixed usage. It is more suitable for darker rooms as it can't get very bright to overcome glare. It has a low input lag that makes it very responsive, but unfortunately, you have to sit straight in front to enjoy the most accurate image due to the poor viewing angles. 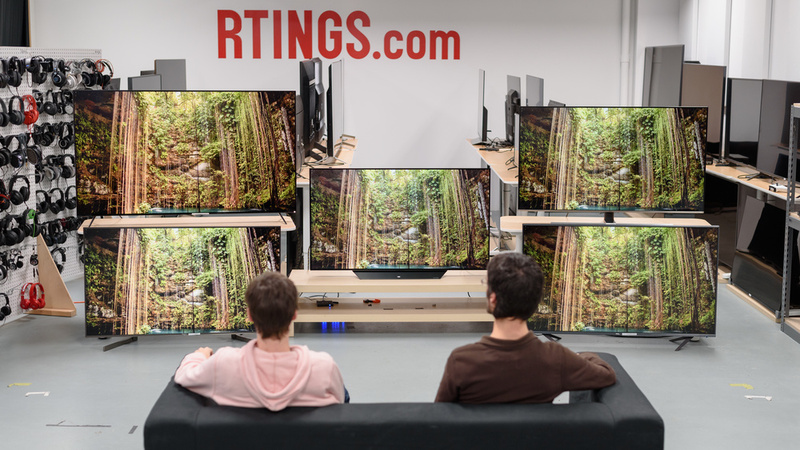 The RU7100 is a decent TV for watching movies in a dark room. It has an excellent native contrast ratio and can deliver deep blacks, but it lacks a local dimming feature to further enhance dark room performance. Unfortunately, it can not remove 24p judder from any source. 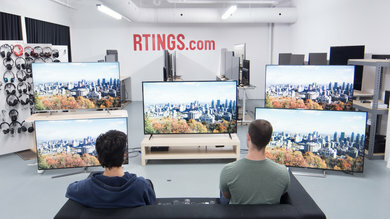 This is a good TV for watching TV shows. It has decent reflection handling but can't get very bright, so it is more suitable for a room with less light. The gray uniformity is good, but the viewing angles are poor, and you are better off sitting straight in front. 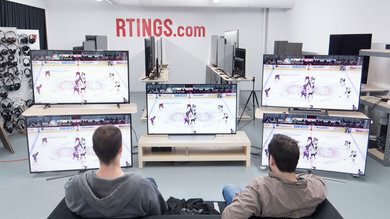 This is a decent TV for watching sports. It has a fast response time, and fast-moving objects only have a small blur trail. 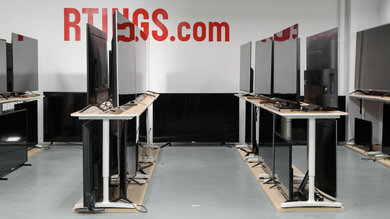 The gray uniformity is good, and you should not experience any dirty screen effect when watching your favorite game. 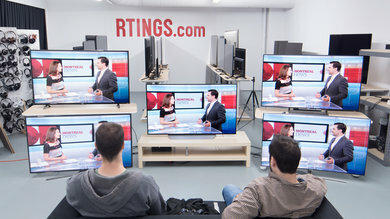 Unfortunately, the RU7100 is not a good choice for a large room with a wide seating arrangement due to its poor viewing angles. 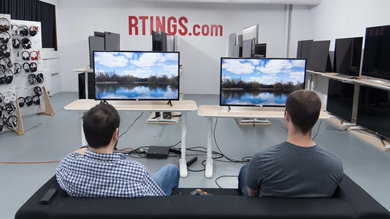 The RU7100 is an excellent TV for playing video games. It has a remarkably low input lag and a fast response time, so it is very responsive to your actions. 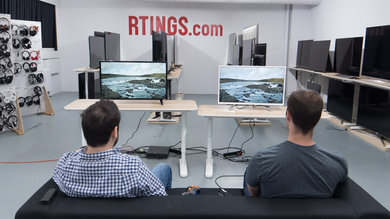 Unfortunately, it doesn't have FreeSync or any other game enhancing features like the ones found on higher-end models like the Samsung Q60R. 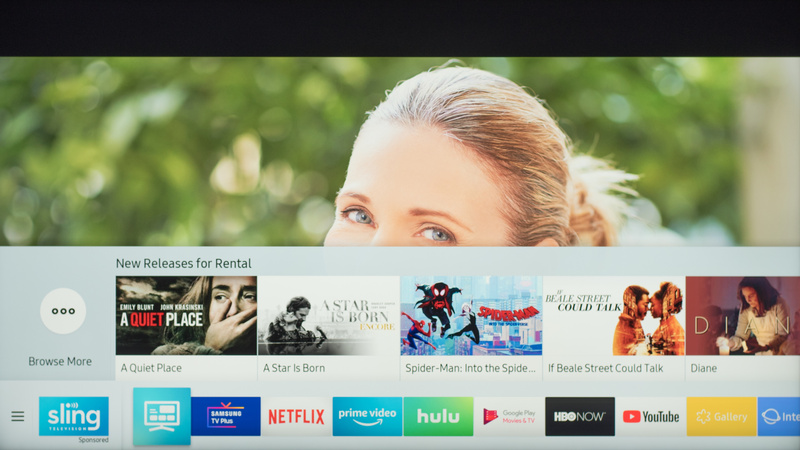 This is a decent TV for watching HDR movies. 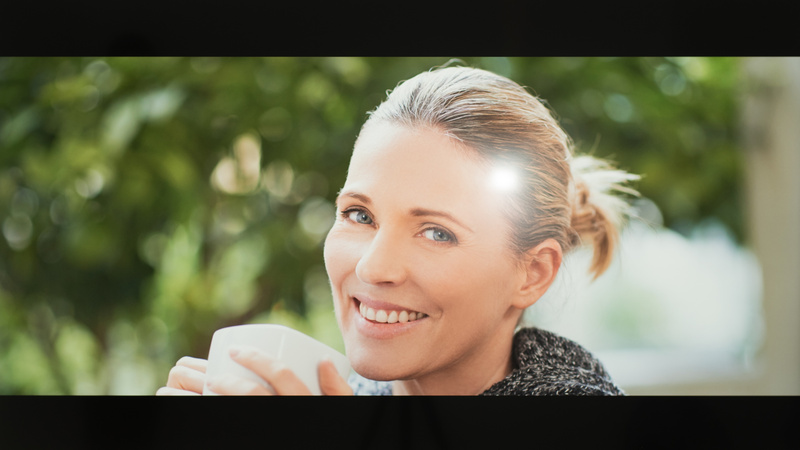 It can deliver deep blacks in a dark room, but it lacks a local dimming feature to further improve dark room performance. The TV doesn't have a wide color gamut and can't get very bright in HDR, so it cannot display HDR content as its creator intended. 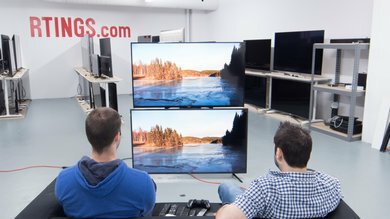 This is a good TV for playing HDR games. This is mainly due to the extremely low input lag and the fast response time, and not so much due to its HDR performance. 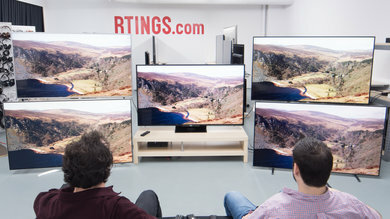 The RU7100 is very responsive, but HDR content does not display as it should due to the lack of a wide color gamut and the low brightness levels in HDR. 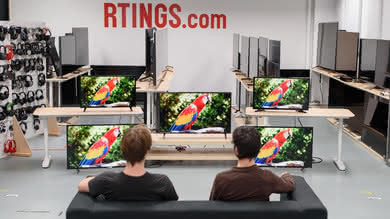 The RU7100 is a great TV for use as a PC monitor. It has a remarkably low input lag, and it is very responsive. Unfortunately, the viewing angles are poor, and you will lose image accuracy at the sides, especially if you sit up close. It can display proper chroma 4:4:4 in all supported resolutions, and this is great.